If Jimmy Fallon Has Time to Send Hand Written Thank You Notes You Do Too! I think we’d all agree that it’s faster to send a thank you by email than by pretty much any other means. A few keystrokes, a click of the mouse and off it goes into cyberspace to hopefully land in the inbox of whomever it is you wish to thank. It can take less than a minute from start to finish and then you’re on to the next thing, no time wasted. And of course since we live in a digital world we’ve come to accept, or is it expect, nothing more. But should it be so? Does everything have to be done with such speed? How much more impactful do you think your thank you would be if it arrived in the mail? Call me old fashioned if you wish but I’d say a well-written and beautiful thank you that is sent by mail has much more significance than one that is sent through email. And although email is faster and easier, doesn’t it make good sense to use the mode that will make a much better impression? Let’s face it, we live in a digital world. All of us are inundated with a barrage of email and there are even business articles on how to deal with your inbox and time management tips on how often to check your email. Do you really want your message of gratitude to get lost in the deluge of email that overwhelms us each and every day? There’s something very personal and satisfying when you open an envelope and find a hand written note. It’s meaningful and intimate and resonates with much more power than the thank you that shows up on our screens. A hand written thank you note reflects your relationship with the recipient and demonstrates that the person is important enough for you to take the time to create a personal message. 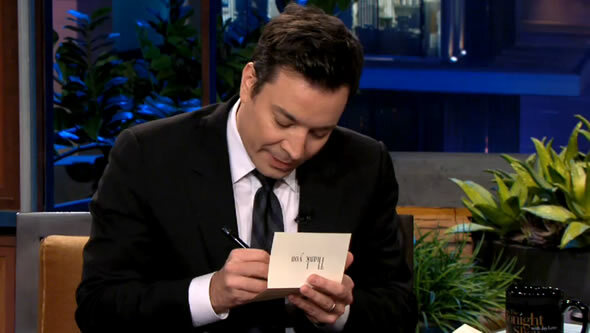 So thank you Jimmy Fallon for helping us to see just how important it is to send those thank you notes. Come to think of it, maybe I should send Jimmy a thank you. I think I’ll do just that! I agree. And, when designing with paper, we still have the opportunity to tell a story as Fallon does with his skit. Use every fold every texture and reward the reader everytime they unfold a flap, or scan down the page.